I’ve been struggling with writers’ block lately, and it’s maddening. It’s time to do something about it, so I did a round up of some of my favorite sources for blog prompts. Kristen Kalp’s blog Brand Camp is full of brilliant and uplifting advice for bloggers and other social media professionals. Her post how to get out of a blogging rut was just what I needed to read. It includes 10 post ideas as well as other steps to recharging the blog, and reclaiming that spark. Danielle at Sometimes Sweet has a great list of 10 post ideas for the stumped blogger. Kelly Oribine lists 99 inspiring blog post ideas. Kate at Centsational Girl lists 50 things to write about when you have writers block. Suzana Uzelac of Social Cafe Magazine provides 20 creative blog post ideas. 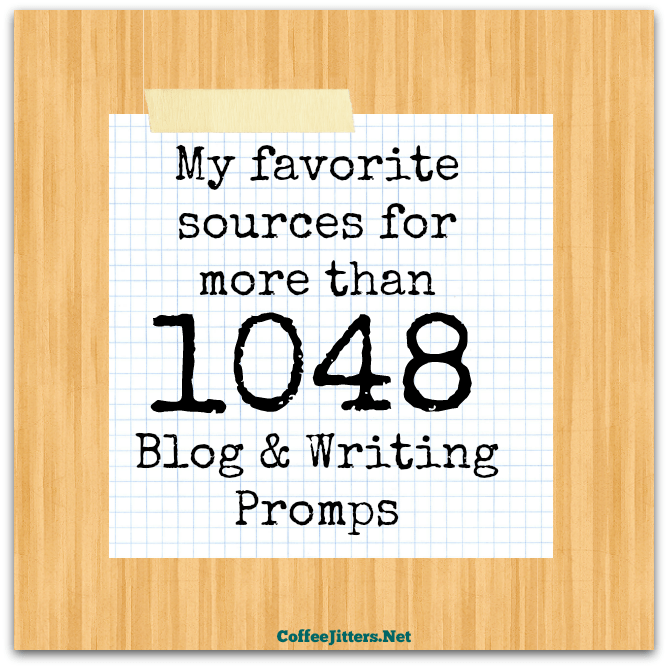 Lacy at Chosen lists 50 prompts in her bloggers block cure. Danielle lists 20 types of blog posts for writers block at Blogging on the Side. The Apple Blue blog shares 101 blog post ideas. Allyssa Barnes has a list of 25 blog post ideas for the uninspired. Nicole at Moments that Define Life has an idea bank of more than 60 writing prompts. Gigi Ross at Kludgy Mom shares a list of more than 600 blog post ideas. That’s more than 1048 prompts right there, although I imagine there might be a few repeats among those lists. If that wasn’t enough, Melissa Culbertson from Blog Clarity (you might remember that as momcomm) serves up the secret to a gazillion blog post ideas. It’s hard to argue with a gazillion. And last but not least, one of my favorite stops for blogging inspiration is the writing prompts database at Mama’s Losin’ It. The app serves up the prompts one at a time. If you don’t like the one displayed, click the inspiration button and it will serve up another. You could sit and click that button all day and not run out of inspiration. Kathy takes the challenge up a notch by hosting a weekly writing workshop at Mama’s Losin It. She provides 5 prompts for the week. Pick one, write up a post on your blog, and on Thursday, link it up to share and read what others wrote. No more excuses. It’s time to get writing. Feel free to share your favorite writing prompts in the comments below.